A former professor of mine, poet Corey Marks, has just won the 2011 Green Rose Prize from New Issues Press. 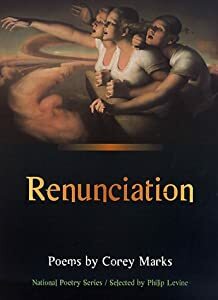 The award honors a new collection by a poet with at least one other book in print (Corey’s previous collection, Renunciation, remains on my shortlist of favorite poetry collections–it’s breathtaking work), and the winning manuscript will become New Issues’ next book. So keep an eye out for Corey Marks’s book The Radio Tree early next year.